The A Team singer has taken top spot in the first Official Streaming Chart which is launched on Monday. Ed, named British male solo artist and British breakthrough act at the Brits, beats acts such as Lana Del Rey, David Guetta and Rihanna to the top. Streaming, listening to music online without permanently buying it, is worth around £35 million a year to the UK music industry. 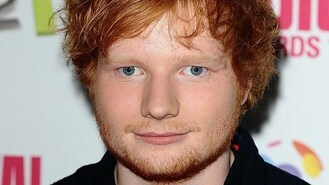 Ed said: "Amazing to hear that I am the most streamed act of 2012. Streaming services and online in general have always been an important way for me to get music out to my fans. A new Official Streaming Chart that recognises another way of enjoying music can only be a good thing." The most-streamed track of the year so far, according to the Official Charts Company, is Somebody That I Used To Know by Gotye featuring Kimbra. The new chart is compiled from information supplied by services such as Spotify and Napster. Official Charts Company managing director Martin Talbot said: "This is a true coming-of-age moment for music streaming in the UK. Services such as Spotify, Deezer, Napster and We7 have been building their audiences over the past few years and are now delivering millions of audio streams every week to hundreds of thousands of music fans.